lot of things do lol. You can't leave out the A...it is not a silent A. BUT....it sure is yummy isn't it. We wont even get started on how he says Pecan. I'm from Louisiana, and I will quickly correct him. After all, that's what good wives do....right? 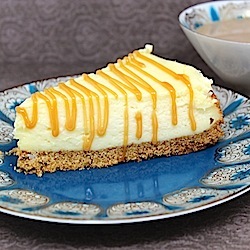 Well even if you pronounce it wrong, you should still make this cheesecake. It's fantastic.....I think I ate half of it....ALONE. Combine graham cracker crumbs, 3 Tbsp. sugar and butter. Press mixture onto bottom of a 9 inch springform pan. Beat cream cheese, 1 cup sugar and vanilla on medium speed until well mixed. Reduce mixer speed to low. Add eggs one at a time, mix just until blended after each egg. Pour filling in pan, over the crust. Bake for 55-70, or until the center is almost set. Remove from oven and let set 10 minutes on a wired rack. Loosen cake from rim of pan. Let cake completely cool before removing rim. Refrigerate the cake, loosely covered for 4-6 hours. Before serving drizzle cake with warmed caramel sauce. This looks fantastic!!! Sorry to say but most of the time I leave out the a in caramel;-) Maybe it is a regional thing?